It’s so easy – because it’s BUNGARD. With our high quality rivets and our famous FAVORIT you will ever get the best results. 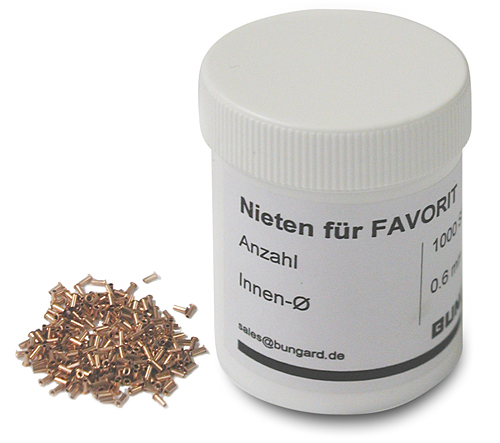 For the Bungard CCD we offer special brass tubular rivets with outer diameter 3.0 mm. With a special tool for Favorit you can use these rivets to arrange and fix multilayer boards before pressing. Similar, but of shorter length are the fixing pins for Hellas/Filmstar to fix the layout to the pcb durcing exposure. Drill diameter: When drilling on CNC machines, the drill diameter should be 0.1 mm larger than the above outer diameter.